Early Stellarton: This mid-nineteenth century photo of early mining operations shows the immediate impact on the landscape. The impact of industrial development on the environment is a topic of grave concern in the world today, but a difficult story to tell with artifacts. We are trying to build our collection in this area. In early photos of mining areas we can see the immediate impact on the environment in the treeless, debris littered landscapes. 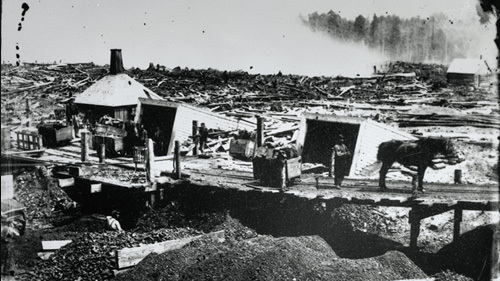 Nova Scotia’s early industrialization has left a toxic legacy hidden in the ground. So much of the development happened in the days before any form of environmental legislation. The early steelmaking efforts in Sydney left one of the worst toxic waste sites in Canada, the Sydney Tar Ponds, which is finally being cleaned up after long neglect.